Battlecry: Gain +1/+1 for each enemy Deathrattle minion. Warlocks have the town exorcist on speed dial in case they unleash the wrong demon. 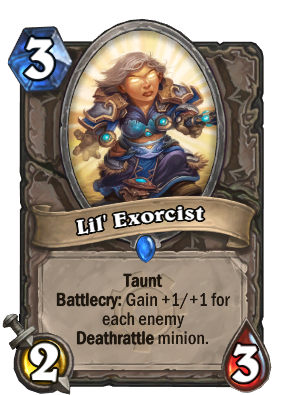 If you were to silence one of the enemy Deathrattle minions, would that qualify as one less minion to buff Exorcist? "Battlecry: Gain +1/+1 for each enemy Deathrattle minion." I agree. The card is poorly worded. I'd tell Blizzard. They will change it if it gets to the right person. Ewww. Is that a Kithkin!? No? You sure?... Okay, then I guess this card is pretty good. What an ugly face for a nice card. Well, duh. How else is she going to scare away the demons? Anduin is only counter to this...the light shall burn you! I think you misread the text, it gains stats based on enemy Deathrattles not your own. It's written UNDERTAKER on it. People love deathrattle for it's value, and they won't stop playing with Harvest Golems, Belchers, Webspinners, Loot Hoarders, etc. anytime soon. This one is an excellent answer for these cards. At it's worst, it will be a 2/3 minion with taunt for 3 mana, which is not that bad. This might be one of the early "must craft" cards in the early days/weeks of GvG. It'll combat Hunter/Aggro (just like Deathlord did when it first came out) until the meta makes a truly solid shift away from faster decks (which is a hopeful stance). Definitely a better anti-aggro choice than Deathlord assuming there's a significant amount of Deathrattle minions in your opponent's deck. Just gotta say, even if this card doesn't receive insane buffs it's still pretty good at slowing down aggro. Outside of a deathrattle heavy meta this card is pretty dead (no pun intended). Good tech card if we're seeing the meta stay or shift back to what it is now.